Grub are here and they are hungry! Over the past couple of weeks, we have started getting questions regarding grub damage and how best to remedy the situation. 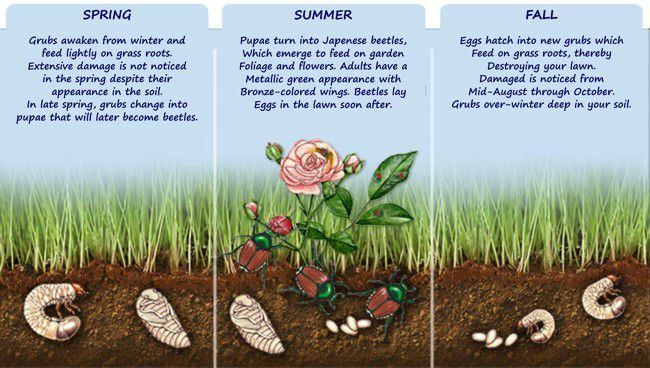 In this article we focus on how you can diagnose and treat a lawn effected by grubs. How do I know if I have grubs? There are a few obvious tell-tale signs that you have grubs in your lawn. First, would be extensive browning during the early fall, late summer. The second would be a lawn that is very easy to pull up. If the dead spots in your lawn pull up in sheets, or if it can be rolled back with ease, you definitely have grubs! Lastly, if you notice digging in your lawn from animals (largely at night), you are seeing the remnants of large animals, rodents, or even crows, that have been searching for grubs in your soil! Amazingly, they are rarely wrong. Because hungry grubs hang out just below the soil surface, they are an easy target for hungry critters looking for a slimy meal. If you are noticing extensive digging in your lawn, it is likely the result of grubs in your soil. How best to treat for lawn-damaging grubs? Grubs feed on the roots of healthy grass just beneath the soil surface. They continuously move around your lawn, so brown spots of affected lawn will grow and become more numerous. 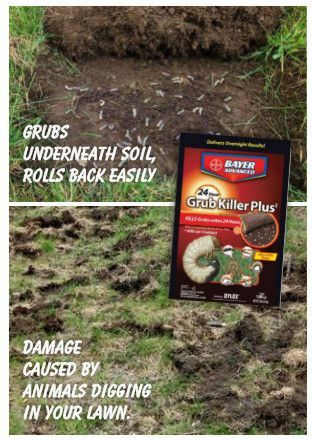 To treat for grubs at this time of the year, there is really only one quick-kill product, and that is 24-hour Bayer Advanced Grub Killer. After being watered into the soil, this chemical is ingested by the grub and they die quickly. Because grubs are always moving around your lawn in search of new healthy roots to nibble on, you can’t be 100% sure where they are active at any given time. As a result, you want to apply this grub treatment on your entire lawn. After waiting a couple of days, you should be ready to reseed all brown areas. You will need to remove dead grass, loosen the soil beneath (refill with loose top soil if needed), and then choose a grass seed that will thrive in your lawn. We hope that you don't have extensive grub damage to your lawn, but if so, we hope this article was helpful! Thanks for reading everyone.